I heard none other than the great Roger Waters make this exact same point in a radio interview once. He said something to the effect of telling all religious leaders that if ONE of them is right, then the REST are wrong. And since they can’t ALL be right, and none of them is willing to concede to the rest, then they must ALL be WRONG. I get this from friends all the time. They say you can’t really be sure there is no god, so you better hedge your bets convert. How do I hedge my bets will all of them? Does unitarian count? You can’t really be sure there is no god, so you better hedge your bets AND convert. We’re back to cognitive dissonance. Of course, “a little philosophy” would be the solution, but with thoughtless fanatics, any logical conflict with their belief is rejected outright. Thus, I see no solution at all so long as fundamentalism exists, and I see no end to its existence. http://tinyurl.com/2grgx4 ……. pointer to a Yahoo story this A.M.
A point that even “great” philosophers seem to miss is that the weird “distinctions” tacked on to all FUNDAMENTAL belief systems are vital in order to show their difference/s from the rest. After all, they are all selling the same product, aren’t they? Then, in order to maintain their difference/superiority, they enforce inane, or even as in the “Astronaut” case above, insane ritual activity (put other lives in danger), to demonstrate their difference/superiority. 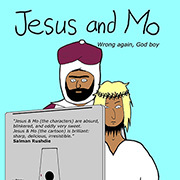 Just showed this “cartoon”?/lesson in philosophy to Kylneth and he said that if this one “statement” was made poster size and displayed in all War Rooms and Religious Indoctrination Centres, the world be a pretty boring place. Nothing to fight about. At all. With your permission, we would like to borrow it and make it the starting point in a soon-2-b-operational new website for the disillusioned and jaded. Diogenes is damn right. That pretty much can change the face of the planet. Ahh yes, it could. But only if they truly believe it. Unfortunately the ability to rationalise the evidence away in order to keep an emotionally satisfying belief is independent of intelligence. The smarter ones are also better at fooling themselves. yeah. Like Intelligent Design preachers graduated from diploma mills rying to use pseudoscience and misconceptions to fool the masses. The problem with this argument is that it can be used to say any position is wrong. You could say the same thing about any sort of debate whatsoever. For example, I think white supremacists are wrong, but they think I’m wrong, so where do you go from there? For that matter, I’m an atheist who thinks Christians are wrong, but Christians think I’m wrong. Pointing out that different religions think the other is wrong doesn’t refute all religions. It refutes the point that all religions are somehow correct or acceptable or deserving of respect. It forces us to examine contradictory positions and use some universal standards to determine which one, if any, is correct. For example, Bob the Fundie thinks gay people ought to be stoned; I think they ought to be treated with respect. Bob isn’t wrong because I think he’s wrong; he’s wrong because human rights are more important than ancient superstitions. The real value in realizing that the other side thinks you are wrong is that it encourages you to think a bit more sympathetically about them, and encourages you to think critically about your own position. I totally agree with Hobbes!! Um… so don’t atheists also fit this category of believing they are correct, while mocking all other beliefs as crazy? I mean, everyone has to see their own belief system as correct, otherwise they wouldn’t believe it. Actually, I just realized someone already made this argument for me. thank you Ellison. 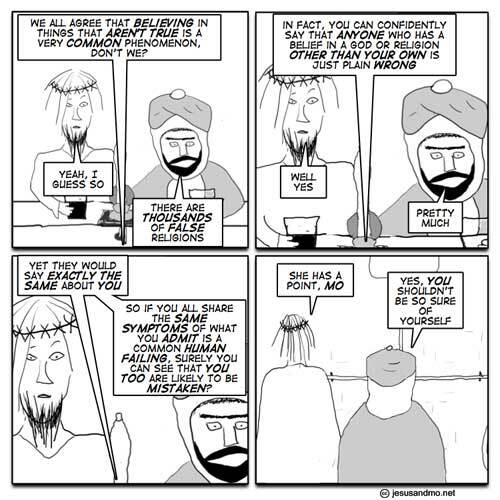 Just to drive the point home, most of the Atheists commenting on this comic were acting just like Mo “yeah, YOU religious people shouldn’t be so sure of yourselves…” LOL. The difference between a theist and an atheist is that one professes a claim that something is true and the other is simply skeptical. I don’t know any atheists who claim there cannot be any god, they rather simply fail to believe in all the choices they have been offered so far. Exactly, Atheism is not a declaration of no faith, it is a non-declaration of faith. It’s ‘I don’t believe that is true’, instead of ‘I believe that isn’t true’.